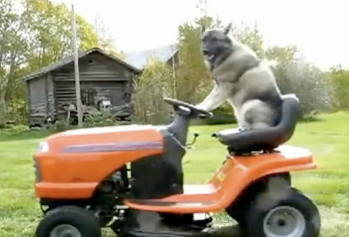 I wound up sitting on these videos for weeks or months in the faint hope that sooner or later some topic would arise that absolutely needed a dog riding a lawnmower or the fattest Englishman in the universe being presented with an animal carcass. This was pretty stupid of me, but I think the point here is that I made at least a token attempt to do something other than dump a bunch of videos into a single post. I wish I had a reasonable explanation for why I thought of this one. The actual news broadcast is itself kind of engrossing, but the moment when the guy's presented with this unidentifiable carcass seemed so momentous that I felt it needed something more to mark the occasion. If I had to hazard a guess, I'd say that's probably a pig. It's the most plausible and least weird option. But, really, it could be anything. I don't think it matters much to that guy one way or another. 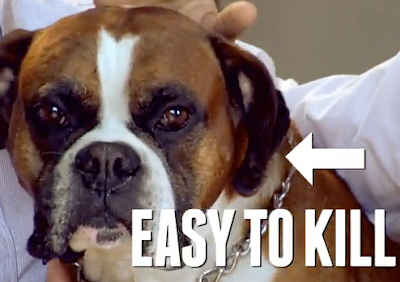 If you think that's in bad taste, check out "Immortal Dog." It's a piece from the Upright Citizen's Brigade's Midnight Show, which seems to be their channel for sketches that can't be done live or offer alternatives to their full scripted shows. It's much more high-octane and showcases their non-"name" players, and this piece at least has made me incapable of not shouting "SCISSORS" in my head any time I use them. Finally, apologies for another slow week. This month has been lousy with reunions and last-minute social and work obligations, and that's likely to continue for at least another week. Good news for next week, however: not only can you look forward to long and cringingly sincere advice to first-year college students and potentially a new look at "Foul Things I Have Eaten," but we will debut a new recurring column that will analyze and critique classic films from The Criterion Collection. There'll be plateaus everywhere. Have a good weekend!